There is nothing quite like the bond between a mother and her child. It is unique with each and this is especially true with the first born. When you have your first child, you come to realize there is a whole different level of love, devotion and commitment that you never understood before holding that little baby in your arms. As you watch them grow into little people, the pride you feel inside grows right along with them. Then, as you decide to have another, you feel a sense of loss for that one-on-one time simultaneously with excitement for the additions to your family. You want to protect that time with your first born, nurture it and respect it while honoring the new joy you are bringing into the world and that of your family. I remember this feeling all too well when our family went from one child to three (twins!). "I knew in my heart, my whole life was about to change. I was so excited, but also so nervous, scared, anxious, and a little heart broken. I knew in just a few short minutes my little girl wasnt going to seem so little anymore. It was that moment, that hug I was closing the door on that chapter of our life, I would never get back. The flashbacks of just Mommy and Paizlee time. I was so afraid I wasn't going to be able to love baby number two the same way I loved baby number one. I felt terrible, like I was robbing her of being the baby, I mean after all she is only 18 months. I was excited to meet baby number two, just wanted to hold embrace and cherish that moment with my baby one more time before it wasnt just us anymore. Going from one child to two makes you feel SO many emotions and this picture captures the real, raw emotional journey it is." 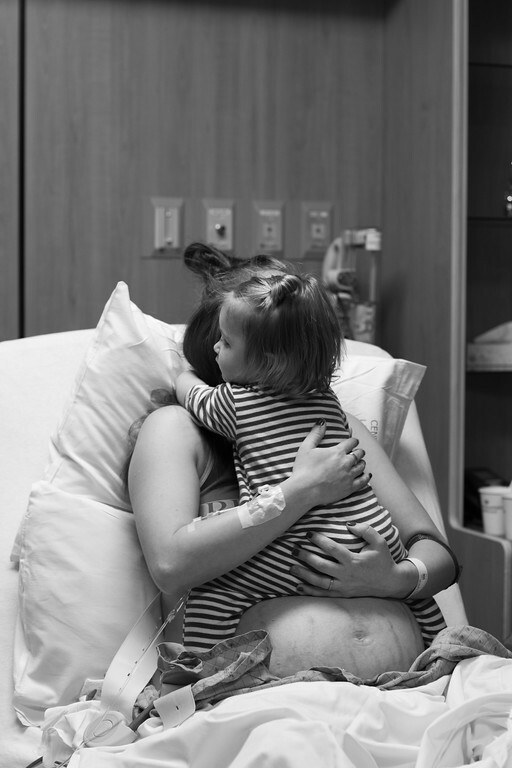 "This photo is why I LOVE capturing birth. This moment you cannot recreate and you will never get it back again. It was the last night of being a mom of one. Here mom is loving on her baby girl while breathing through a contraction. So beautiful!" says Chelsea, the photographer who captured these precious moments. Want to meet other moms who know what you're going through as a new mom? Download the mom.life app where moms are chatting, sharing advice and making new friends. The app is free and live moderated, so no mom shaming allowed!